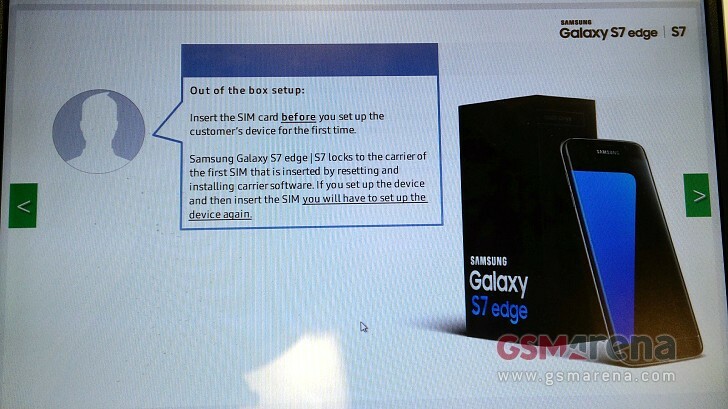 A leaked slide we got through our tip line suggests Samsung will tweak the Galaxy S7 and Galaxy S7 edge to lock to the carrier of the first inserted SIM card. Until now most of the Samsung Galaxies sold through carriers came unlocked. Don't panic! This doesn't concern the SIM-free and carrier unlocked models. The slide seems to be part of a presentation to telcos. It says the customer's device should be configured after inserting the SIM card. It seems Samsung found a unified solution for carrier locks, and this will make obsolete the procedure where each carrier has to order custom batches of Galaxy smartphones. This also means lots of carriers that weren't locking their Samsung smartphones because of all the hassle, now will do it. Don't forget Samsung's unlocked phones will be still region locked, which is a whole different thing. They will lock to the region in which you activate them first (Europe, Asia, Africa, etc.). We'll know more once the Galaxy S7 series hit the shelves. Thank you, Jeff, for the tip! If I buy a Samsung Galaxy 7 edge,will I be able to use it in my home country South Africa. I do not want to use it in Korea.